Premier League sides have been alerted after Atletico Madrid manager Diego Simeone gave the go-ahead for the club to sell winger Yannick Carrasco, according to AS. Both Manchester United and Chelsea have been heavily linked with the Belgium international in recent months, with Carrasco's contract boasting an £86 million release clause. Both Nicolas Gaitan and Luciano Vietto are also understood to be on the transfer list. 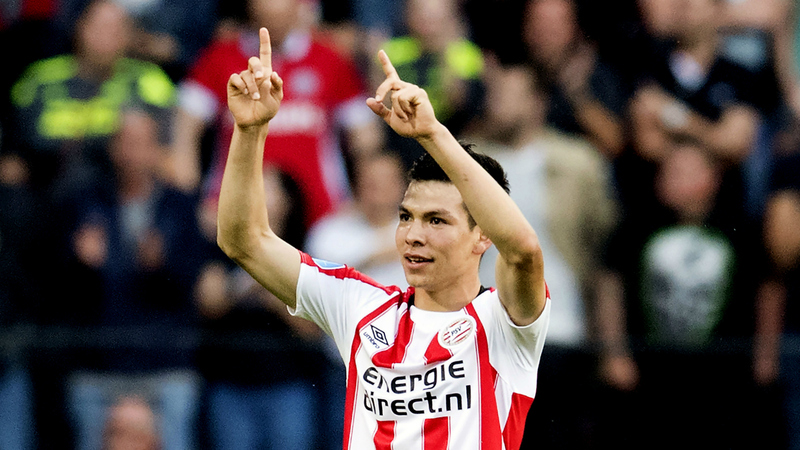 Arsenal and Liverpool are both set to make a move to sign Mexican sensation Hirving Lozano from PSV, according to the Daily Star. The 22-year-old winger joined the Eindhoven club from Pachuca in the summer after rejecting Manchester City and has been a revelation in the Eredivisie with 11 goals in 16 games. He has been attracting Europe's top sides with his starring role for Phillip Cocu's side and the two English clubs are expected to make a push for him. Arsenal star Mesut Ozil tops a list of five players Ernesto Valverde wants to bring to Barcelona in the upcoming transfer window, claims the Express. Out of contract in June, Ozil is highly coveted at Camp Nou, and could be available for a bargain price should Arsenal wish to cut their losses and avoid losing him on a free transfer. But the Germany international is just one of the names linked with Barca, alongside Lyon's Nabil Fekir, CSKA Moscow youngster Aleksandr Golovin and Schalke duo Max Meyer and Leon Goretzka. Arsenal have seen their efforts to sign Juventus defender Mehdi Benatia frustrated after a bid worth £35 million was rejected, reports the Sun . But the Gunners may see their chase come to nothing as Juve appear set on retaining Benatia's services. Barcelona are set to finally land long-term defensive target Yerry Mina in the January transfer window, according to Sport . The Colombian, a champion in Brazil with Palmeiras, is already under a first option at Camp Nou. And Barca are hoping to begin talks over Mina as soon as Javier Mascherano's transfer to China is finalised. Chelsea manager Antonio Conte has confirmed he would be delighted to work with Arturo Vidal again . The pair came together to great effect at Juventus, and Vidal has now been linked with a reunion with his former boss at Stamford Bridge. Atletico Madrid are set to demand Aleix Vidal form part of any deal that brings Antoine Griezmann to Barcelona, reports Don Balon . The Catalans have long been in pursuit of the striker, even prompting Atletico to make a formal complaint. But with speculation continuing to loom over the Spanish capital, Vidal would be acceptable compensation for losing one of the Colchoneros' key players. Lucas Moura has emerged as a potential transfer target for Chelsea this January, reports Buzz Sport . The Brazilian has been frozen out of Paris Saint-Germain's plans, and is keen to seal a move away. And he would be an interesting choice for the Blues should Willian choose to move to China. The Montreal Impact are looking to sign Canada international Atiba Hutchinson from Besiktas, according to Kartal Bakisi . Hutchinson, 34, would bolster the Impact's options in central midfield after the retirement of Patrice Bernier and expiration of Hernan Bernardello's contract. Lazio are willing to sell Stefan de Vrij in the January transfer window after failing to agree a new contract with the Dutch defender, reports Calciomercato.com . De Vrij is out of contract at the end of the season, and he has been linked with a move to Liverpool and Lazio’s Serie A rivals Juventus. Reports value De Vrij at €30 million and if that figure is met in the New Year then Lazio will let the centre-half leave before next summer. Arsenal will have to pay around £60 million if they want to sign Lyon star Nabil Fekir at the end of the season, claims the Daily Star . Fekir has been linked with a string of Europe’s leading clubs, including Barcelona and Manchester City, while are Arsenal are keen as they assess potential replacements for and Mesut Ozil. Lyon have ruled out selling Fekir in the January transfer window, with Arsenal aware they will have to fork out a club record €60m to sign the forward once the season is over. Manchester United manager Jose Mourinho is confident that £60 million will be enough to sign Juventus star Paulo Dybala next summer, according to the Daily Star . There are reports of a rift between Dybala and the Juve hierarchy, although head coach Massimiliano Allegri has denied this, and ex-Inter boss Mourinho thinks the attacking midfielder could be lured to Old Trafford.